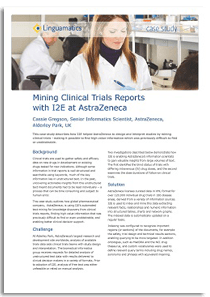 This case study describes how I2E helped AstraZeneca to design and interpret studies by mining clinical trials - making it possible to find high value information which was previously difficult to find or unobtainable. In this case study, I2E’s automated text mining was essential to extract and synthesize high value information found only in the unstructured text regions of the trial reports. I2E enables AstraZeneca’s information scientists to ask precise questions of the clinical trials reports, delivering insights to clinical decision makers much faster than previously possible and including information that would otherwise have been missed. I2E results presentation is also tailored to the clinical team’s needs.